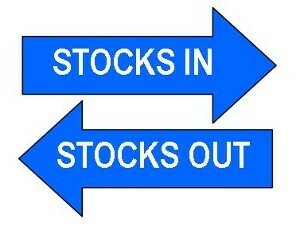 Most people think of the major stock indexes as a stand-in for a certain sector or category. The S&P 500 represents large companies, the Russell 2000 tells you what small capitalization stocks are doing, and the Dow represents broad economic sectors. You see tables showing the return of these indices over decades of time, and you might assume that they are made up of the same stocks during that time period, instead of trading in and out of stocks like a mutual fund. But in fact, all of these indices are somewhat actively managed, in the sense that they move stocks in and out of the index on a regular basis. This became news when the Dow Jones Industrial Average decided to add the biggest company in the world—Apple—to its mix of 30 stocks, replacing AT&T. The Dow has changed slowly but regularly over time; of the 12 stocks in the index when it was announced in 1907, only General Electric remains on the list. Only four companies remain from the 1935 list: GE, DuPont, ExxonMobil and Procter & Gamble. Sometimes these changes are dictated by the structure of the index itself. Microsoft and Apple were once small cap stocks appropriate for the Russell 2000. They have long since graduated out of small cap status. Other times, the index is adjusted to more closely represent the overall economy. The S&P 500 famously added tech stocks in the late 1990s in an effort to catch the fever of the times. In fact, many people might be surprised to discover how much the index changes each year. Looking at the 500 stocks in the current S&P 500 list, you find that 159 firms were not included in the 1970 version. More recently, the index seems to be trading stocks in and out at a faster clip, swapping in 10 stocks in 2010 (NRG Energy, Cablevision Systems, F5 Networks, Netflix, Newfield Exploration Co., Tyco International, Ace Limited, QEP Resources, CarMax and Cerner Corp.); 18 in 2011 (WPX Energy, TripAdvisor, BorgWarner, Perrigo Co., Dollar Tree, AGL Resources, Cooper Industries, Xylem, Inc., TE Connectivity, Ltd., The Mosaic Co., Accenture PLC, Marathon Petroleum, Alpha Natural Resources, Chipotle, Blackrock, Edwards Lifesciences, Covidien Plc., and Joy Global, Inc.); 20 in 2012 (AbbVie, ADT Corp., Alexion Pharmaceuticals, Delphi Automotive, Dollar General, Ensco, Garmin, Ltd., Kinder Morgan, Kraft Foods, Lyondell-Basell, Mondelez International, Monster Beverage, Pentair, LTD, PetSmart, Phillips 66, Blackrock, Joy Global, Covidien, Edwards LifeSciences and Seagate Technology): 13 in 2013 (Allegion, Ametek, Delta Air Lines, General Growth Properties, General Motors, Kansas City Southern, Macerich, Nielsen Holdings, PVH Corp., Regeneron, TransOcean, 21st Century Fox and Vertex Pharmaceuticals) and 11 in 2014 (Affiliated Managers Group, Avago Technologies, Cimarex Energy, Discovery Communications, Level 3 Communications, Mallinckrodt, PLC, Royal Caribbean Cruises, Martin Marietta Materials, United Rentals and Universal Health Services). So far in 2015, the index has dropped Safeway and Covidien, and added HCA Holdings, Endo International. Since 2010, some notable names were dropped: The New York Times Company, Tribune Co, Office Depot, Eastman Kodak, Qwest Communications, Bethelehem Steel, Owens-Illinois, Novell, Radio Shack, National Semiconductor, Janus Capital Group, Sara Lee Corp, Sears Holding Corp., H. J. Heinz, Sprint Nextel, Advanced Micro Devices, J.C. Penney, Abercrombie & Fitch, U.S. Steel Corp., and Safeway, Inc.
How will substituting Apple for AT&T affect the Dow? Since the Dow is weighted according to the share price of each stock, we can expect movements in Apple stock to greatly affect how the Dow performs going forward. When Visa International undergoes its anticipated four-for-one stock split, Apple’s $100 shares will become the biggest component of the Dow, and a $10 drop or rise could lead to a 100-point movement in the overall index. A $33 stock like AT&T would have been far less likely to rise or fall by that dollar amount. Bigger picture, when you look at the long-term performance of an index, remember that this is not achieved with the same mix of stocks throughout that history. The indices may “trade” more slowly than most mutual funds, but they’re turning over their portfolios over time as well.